“Probably the best designer in the world,” confidently reads Martine Rose’s Instagram biography. With such chutzpah one can’t help but explore the reasons why this might be the case. Perhaps it is her ability to draw fashion crowds to distant London locales: last season it was Seven Sisters on a rainy Sunday night, an hour away from central on the day of a tube strike; this season it was the Stronghold Climbing Centre in Tottenham Hale, a forty minute trip from central. Or maybe it is her covert influence on the current state of fashion—Rose consulted for Demna Gvasalia at Balenciaga at the time of the roaring success of the exaggerated proportions. It could be how she disappeared from the show schedule for a number of years but her return was feverishly anticipated. 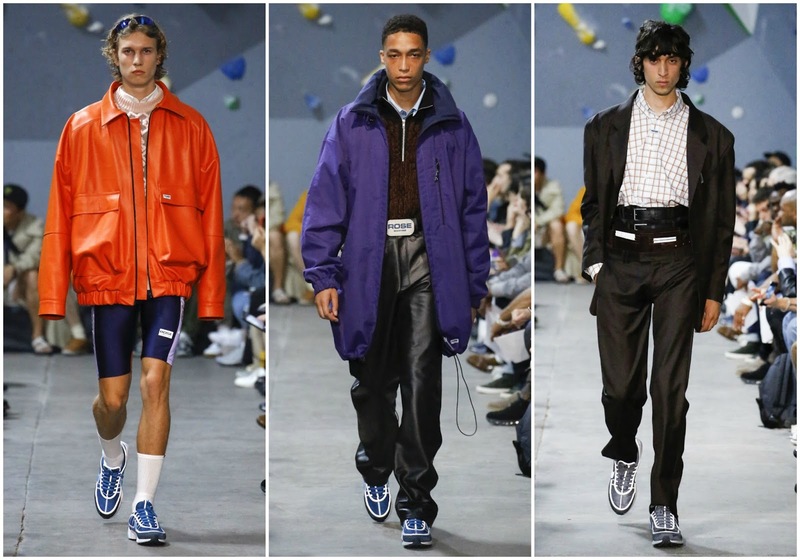 Whatever it may be, Martine Rose is a powerful force in the industry. She’s quietly influential, exerting her energy in unassuming ways and, in doing so, presenting truly wonderful clothing that challenges perceptions; in an interview with Vogue Runway’s Sarah Mower, she declaratively hopes to “[make] the ordinary extraordinary.” Having been previously inspired by American Psycho, here she looked to the photographic oeuvre of Trevor Hughes who lensed the Toronto underground scene of the 80s and 90s. Undeniably, 80s and 90s sensibilities permeated the show. Increasingly, the portrayal of the convergence between formal workwear and casual clothing becomes a recurring motif this menswear season. It developed last season with the reissuing of suiting and emphasis on tailoring, the notion of extreme normality, where proportions are contested. There were references to MTV—Rose redesigned their logo, replacing the TV with “Rose”. Founded in 1981, the company defined music culture at the time before segueing into questionable territory, programming shows like 16 & Pregnant or Teen Mom. The Martine Rose character may appear as a striking contrast to this but there is undeniable joy in her work. She fetishised normality last season, presenting striking suiting in rich palettes. Here she played with gorpcore, citing “climbing, golfers, bicycle messengers” as inspiration. There were tan shorts fit for the gold course, sturdy footwear from Nike and colourful anoraks; lycra, too, made an appearance. The wide-shoulders were recognisably Balenciaga staples, also pointedly 80s-related. This should come as no surprise given her recruitment by Gvasalia to consult on his menswear collections where this now signature shape originated from. She has a keen eye. She knows what works and her clothing isn’t overtly cynical. In fact, it’s rather celebratory. It celebrates her sleight of hand, her eye for designing for a modern man—in all his iterations, not just the singular vision of the straight white male. 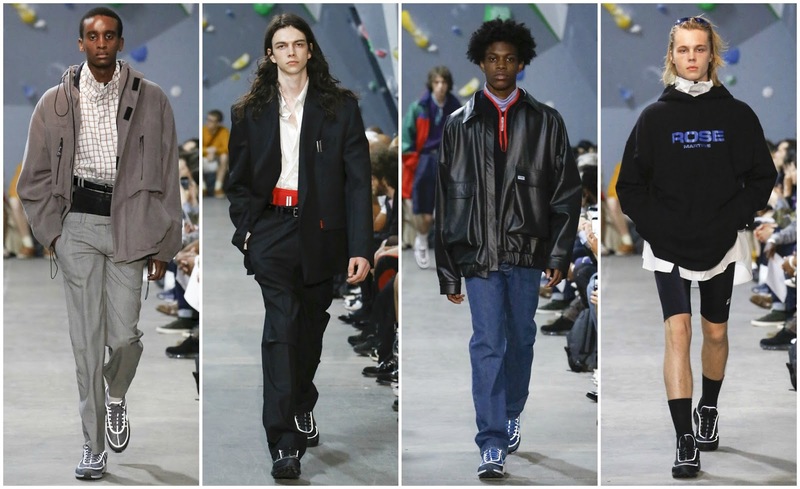 What makes Martine Rose so special? Is her self-ingratiating Instagram biography true? Perhaps she isn’t the best designer in the world but she is remarkable. There is something captivating about the simplicity of her work but also her determination and the enchanting spell she has cast on the rapt fashion industry. What she brings to the table is a unique perspective, her vision of how men should dress. It reflects the world around us. (Mostly positive casting contributes to this too.) There are notes of perversion that leave us questioning, what exactly is it Martine Rose trying to achieve? My guess: she’s trying to be the best designer in the world… and she’s succeeding.